In yet another example of a new packaging design trend that turns “Branding” into “Blanding”, Sierra Mist has changed their logo and bottle design. As with other packaging redesigns I have seen recently, there is nothing “New and Improved” about the drink, no special promotion, no advertising campaign or any other reason I can see why they needed to change. Other than change for change’s sake. However, they did succeed in making the product harder to find amongst all the other green two-liter bottles on the shelf. Why do we have logos, anyway? Logos serve a couple of purposes – they are the distinctive mark by which consumers can identify a product, and they serve as a reminder that we bought the right thing. But mostly they serve to differentiate one product from another, especially in a retail environment. So if your logo is meant to help your product stand out from the crowd, why would you redesign it to become as generic as possible? Am I missing something here? It’s horizontal, easy to read, and pops on the background of the green bottle. Embraced some vague, “Blair Witch Project” style background graphic that I think is supposed to be a forest (presumably in the Sierra Nevada Mountain range?). The reaction at home to the new packaging was fairly predictable. I got accused of buying the cheap brand instead of what we like; and I heard protests that it doesn’t taste the same anymore in the new packaging. Now I don’t believe that, but perception is reality in our world of marketing. 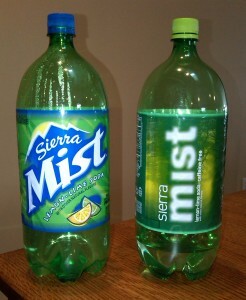 So congratulations to the branding geniuses at Sierra Mist – you launched a new logo right into obscurity. Where was the CMO in this decision? Who’s running the ship here, the designers or the brand managers? Did anyone consult the field reps to see how consumers and store managers might react to the new packaging? Next time, go for change we can believe in. P.S. I took this photo with my BlackBerry Storm. What do you think? Seems to me that the agencies must be laughing all the way to the bank. In a down market, they sure can create a lot more work for themselves and a ton of ad billings by convincing clients that this is the perfect time to go for a rebrand. Go back to the Tropicana rebranding. They launched a HUGE campaign to announce the new (I sure can’t say improved!) look across all channels, including highway billboards (and WHEN are designers going to realize that when you’re driving 50-70 mph that you can’t take your eyes off the road long enough to see those small fonts so you have no idea that you’re looking at a Tropicana ad). That must be a very large ad spend, especially in today’s down market. Maybe I’m old-fashioned, but to my eyes, these generic-looking ‘new’ brand images don’t stand out on the shelf, in a magazine or on a billboard. The similarities between the Tropicana and the Sierra Mist rebranding efforts does make me rethink my previous post (re: Tropicana). Is there a rationale to this type of branding? One based on some kind of recognition or focus group testing? Or is it just an advertising firm with some persuasive pitch that convinces brand managers to do adopt these changes? Are we missing something? Because the consensus is….it doesn’t make sense. Does it have something to do with an iPod or an iPhone? Simple lines, curved edges, modern, pixelated, etc. etc. I must admit that the out-of-focus “MIST” print does draw my eyes to the label. If i continue to see this trend, I’m going to assume that there is more to the phenomena. what an absolute joke. couldn’t agree with you more stapper….what are they thinking? its so obvious. I noticed that Holiday Inn Express has a new logo, and they’ve changed the very familiar H to a new design that is reminiscent of Hoover Vacuums. Maybe customers will make a subconscious connection with Holiday Inn = Cleaner rooms. On first glance, I don’t get the new design at all. On second glance, it makes perfect sense. Notice the type is all lower case. Screams “really cool, hip designer who wears cool glasses and has a cool haircut.” Probably convinced the CMO, who may also wear really cool glasses and have a really cool haircut that this was product design 3.0 (you have to remember that being 2.0 isn’t cool anymore). On third glance, it’s all about making this the top choice to mix with booze. That explains the blurry and vertical “mist” – they hope that the blury and vertical type will subliminally trigger the desire to drink alchohol. You have to squint your eyes to read it, just like you do when you’re drunk. And you have to tilt your head to the side to read it, which is exactly the degree tilt of your neck when you all hammered and can’t keep your head up straight. I gotta say, they might be on to something here. Or maybe they just listened to the wrong guys with cool glasses and cool haircuts. Classic! I need to get cooler glasses and a sweet helmet! PepsiCo is rebranding all over the place. Hasn’t Coke already beaten you to the punch Pepsi? Hasn’t Coke been “bringing humanity back” since their “coke side of life” campaign? You used to be the “cool” one, and it was working for you. You already own that segment, why let it go with a strategical carbon copy of what Coke is doing? And the PepsiCo plan continues to move forward. At least this isn’t that much of a departure from the last logo, I just question the shortening of Mountain to Mtn. Yes, they are talking to there demographic…but…just doesn’t feel right. Hilarious…I wrote this before reading your comment about “The Blair Witch Project.” Great minds think alike, I guess. See the link for some comments about the name as well. I gotta say, as much as I dislike the new package design, in my opinion the old one is so amateurish that this is still a little bit of an improvement.